Press 'Next' on the welcome screen. 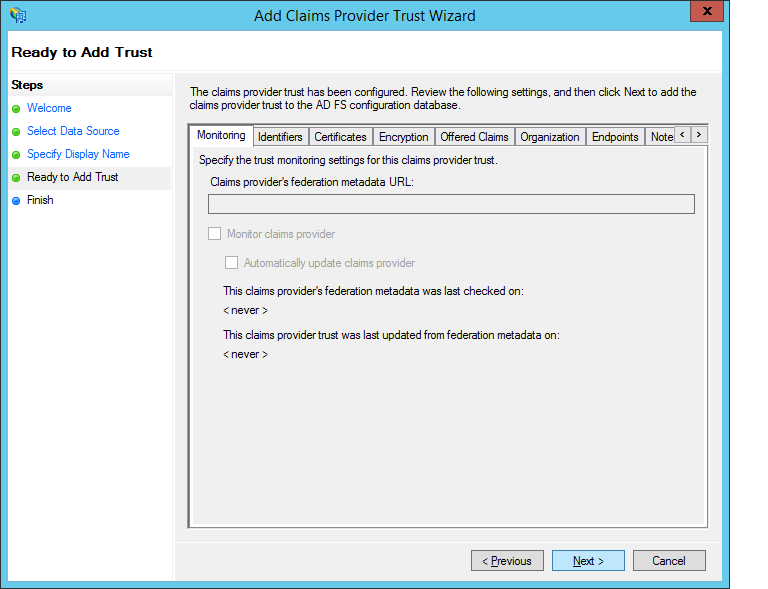 The first thing you must do install the GridGuard's SAML Metadata on ADFS server. If the ADFS server has direct HTTP access to the GridGuard server, you can add the metadata URL for the GridGuard SAML Configuration instance. Find out the specific metadata URL, Login to the ACC and click on the SAML Configuration Menu on the left hand side. Then click on your ADFS entry and click on the 'Reference URLs' tab. You should find the Metadata URL. 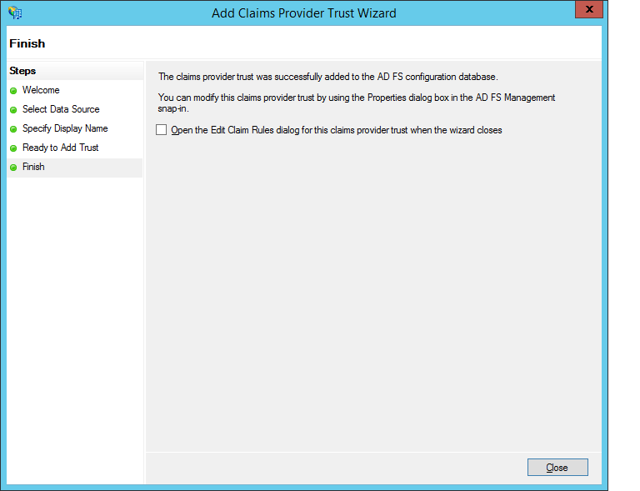 Cut and paste that URL in to the ADFS claim provider wizard. If your ADFS server cannot directly access the GridGuard server over HTTPS, you can navigate with a web browser to that URL. Save the XML file that is shown and upload to the ADFS server and import metadata the XML file via the filesystem. Enter the name and the description that will be displayed when a user selects GridGuard authentication on the ADFS landing page. 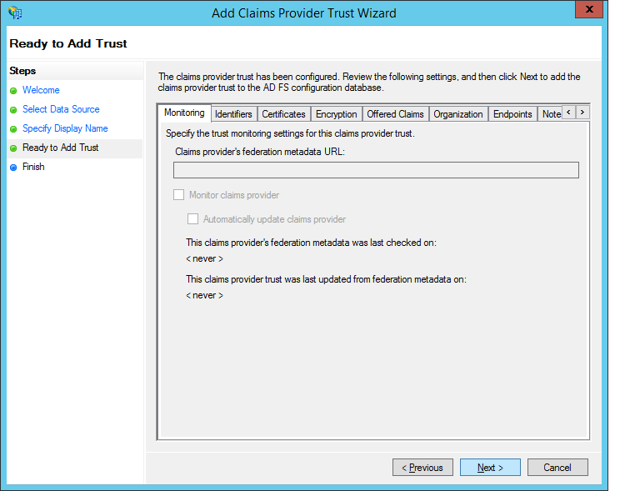 Finalizing the Claims Provider Addition. 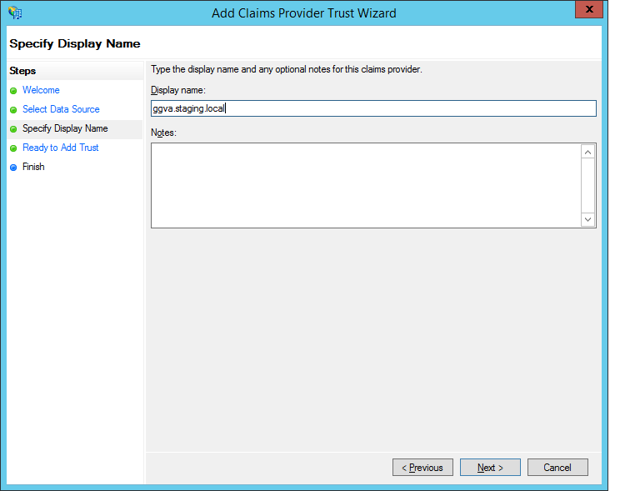 Uncheck the 'Open Claims Rules dialogue' box. Then press 'Close'. 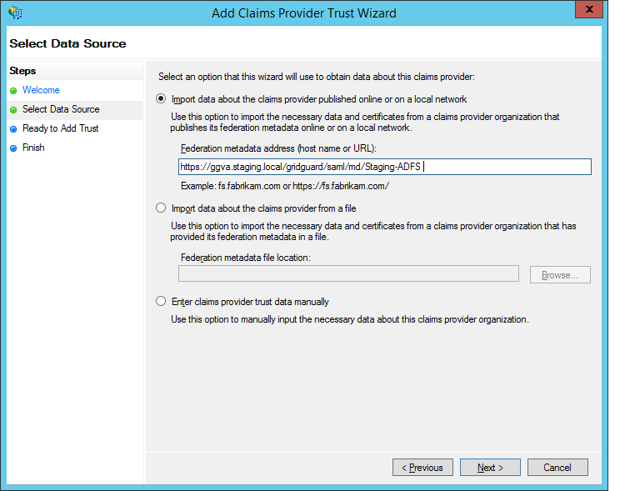 By default, ADFS assumes that the claims provider will use SHA-256. GridGuard-VA does not support SHA-256 at this time. To configure ADFS to use SHA-1 you must go to the 'Properties' of the GridGuard-VA ADFS claims provider entry. Then click on the 'Advanced' tab. 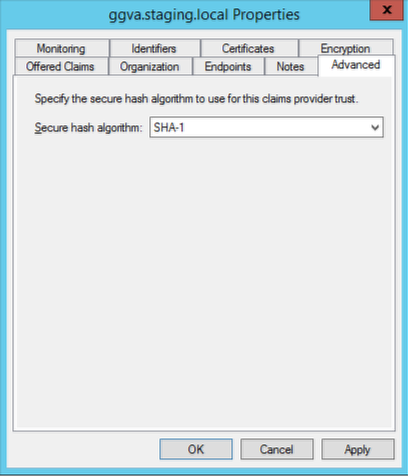 Change the Secure Hash Algorithm to 'SHA-1'. Press 'OK' to complete the change.